They’re not quite spy glasses, but they can call an Uber and text your pals. Smart glasses are finally getting a much-needed makeover. 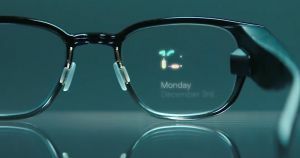 North Inc.’s new Focals, which will launch in Brooklyn and Toronto showrooms in November, are an attempt to bring a hint of style into the dorky world of wearable tech. Traditionally, smart glasses like Google Glass have been awkward and weird-looking — not to mention more than a little creepy, thanks to their covert recording capabilities. If your bank account has too many zeroes at the end, North says its $1,000 non-prescription lenses will let you walk around town with your own mixed reality display. According to the company’s website, Focals and have a built-in version of Amazon’s Alexa personal assistant, which will let you text your pals, navigate you around town, call an Uber, and give you weather and calendar updates. And thankfully, unlike the glassholes who used their Google Glass to take sneaky recordings, Focals don’t have a camera. The jury’s out on how well they work at all, since the company is asking for pre-orders based on some renders of what the glasses’ display might look like. But at the very least, it’s nice to see a way for smart glasses wearers to pretend they’re not quite as dorky as they definitely are.